What car will you want five years from today? If you’re not sure, that’s ok; it’s not your job to predict the future. But it is the job of car designers. As director of Digital Design & Design Beyond the Car at Daimler, Klaus Frenzel and his team research about, speculate on, and design for the next generation of mobility. Whether you are looking for a spacious family vehicle that drives itself or a sporty ride to zoom around town, the design team of Mercedes-Benz and the other Daimler brands is working on glamorous and intelligent solutions to get you from place to place. 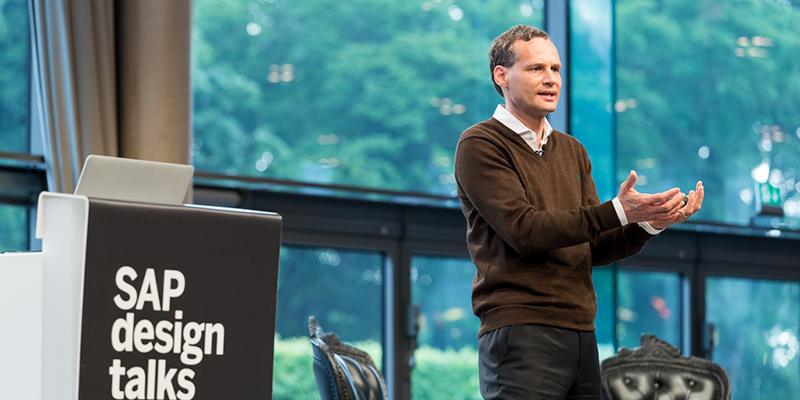 Klaus spoke recently to a large crowd of SAP employees at our headquarters in Walldorf, Germany and around the globe via live broadcast as part of the SAP Design Talks series. Like at SAP, the importance of design has been growing steadily at Mercedes-Benz over the years. In the 1950s there were just a few designers at the automotive company. Since then, that number has risen to over 500. The company now considers itself “a mobility provider,” and its designers are leading the way in that change. The motto of the Mercedes-Benz design team is “modern luxury,” and it permeates everything the team produces. But what exactly is luxury? “That is changing all the time,” maintains Klaus. ”But what doesn’t change is that it is the rarest, but most desirable thing at that moment in time.” So, the team’s job is to craft the luxury of the future. The result must always express both sensuality and purity, the dual litmus test that every Mercedes product and concept must pass before it reaches the customer. While the job of the designers is to make Mercedes vehicles emotional, intelligent and luxurious, it is also their job to illustrate the big picture of the future. That is why Mercedes does not just design cars. They envision and craft whole experiences: moving beyond the traditional work of car designers to also encompass the entire digital experience in, around and beyond the car. An extension of that experience is to mobile devices, mobility services (such as Car2Go, MyTaxi, Croove, Moovel, and Blacklane), clever parking solutions for autonomous cars, and intelligent charging options for electric vehicles. But the team goes even further, teaming up with selected partners to design high-end lamps, clothing, aircraft interiors, and even London apartment rentals. As if those design endeavors didn’t go far enough beyond car design, the team has envisioned mobility in the context of a future city. Now that’s a big picture!